The Protect-A-Bed Mattress Protector is the most effective mattress protector ever produced. The Protect-A-Bed Mattress Protector is the most effective mattress protector ever produced. Every mattress needs protection from allergens, liquids, dust mites and stains that can be detrimental to not only your health but to the life of your mattress. These mattress protectors promote excellent hygiene by providing superior protection and mattress cleanliness. Available in five different sizes ranging from bunk (75cm x 190cm) to Super King(180cm x 200cm). Pillow Case protector also available. Comfortable, natural materials over a polyurethane film provides a waterproof barrier to liquid and stains, and a barrier of protection for all ages. The polyurethane film, called Miracle membrane is exclusive to Protect-A-Bed and will help to protect your family from bacteria. The sleeping surface is also 100% pesticide free. 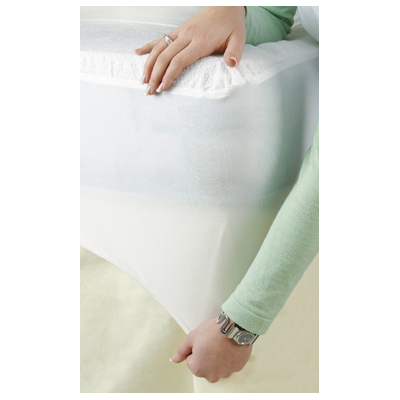 These mattress protectors are thin, fitted-sheet syle with super-stretch material which provide superior comfort. They are waterproof on the top surface and are never hot to sleep on. They are completely air vapour porous which allows your body heat to pass through the surface which subsequently keeps you cool and comfortable all night long.